So I have been having a GREAT time in Mooshu (Though I still have a craving for fried rice and eggrolls) – I’m actually finding I like the story better than Marleybone, it’s more interesting and I feel more drawn into it. In Marleybone I was basically cleaning up street crime and uncovering a huge criminal conspiracy, which was cool, but in Mooshu it’s like I’m helping them reclaim their emperor, helping them to fight off a demon invasion and purify their lands – it jut seems cooler and more noble. Besides, those lamb guys and their big brown eyes are impossible to resist!! So cute!! 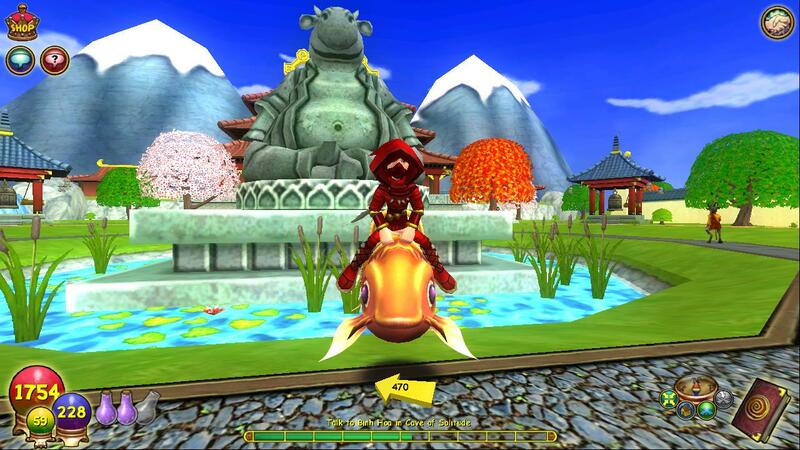 One hint I can give is something I started doing in Marleybone, and it’s REALLY helpful here in Mooshu – in each new area you unlock that has teleporters, do a quick run around the area and unlock all the teleporters first thing. This makes travel a lot quicker and in some places a lot safer, since there seems to be a lot more ‘choke points’ in Mooshu, areas where you can get pulled into a duel more easily. And as far as gardening – well I guess I do have to try it since I keep getting seeds as drops, including crowns seeds like pink dandilions. I’ll try it this week, might even record it and see what happens. Looks cute, in any case – not as cute as the big-eyed lamb people but still cute! For equipment I’ve done pretty well recently – all in the bazaar, though – nothing of note in drops. Even the ‘big’ boss fights I’ve been in haven’t dropped anything decent, but the bazaar has been fantastic! My best find was Fushiko’s Shroud, giving 3% fire accuracy and 5% fire damage, plus extra health and defense. I have the Wrap of the Leaping Flame, giving another 3% accuracy and 6% damage, and then the War Oni’s footwraps giving 2% accuracy and 4% damage boost. And then my favorite new item – Jade Oni’s amulet of Duplicity, which gives a Hydra card – THAT is a fun spell! My total accuracy boost is 8% and damage is 17%, which is certainly not bad. Maybe not the best, but still not bad. This entry was posted on January 2, 2011 by dittowizard. It was filed under Wizard 101 . Pink dandelions are currently my favorite seed. They give really nice reagents when you harvest. They’re pretty easy to care for too. seems like they can take forever to grow. That is a brilliant idea Sierra – I love it. I have no idea how to do it – but that’s what google is for 🙂 – time lapse video of virtual plants growing – I LOVE this idea.